"Religiously Knowledgeable" Atheists Believe in God? 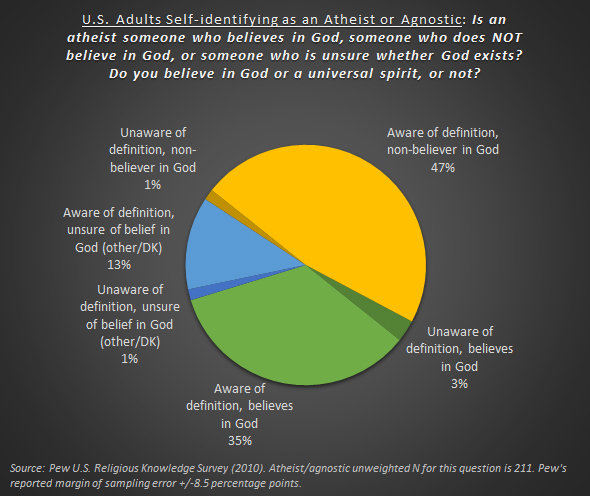 Digging a bit deeper into the data (available here) you’ll find that only 47% of adult atheists and agnostics in the United States are aware that an atheist is “someone who does not believe in God” and does not believe in God themselves. Additionally, the “knowledgeable” agnostics presumably appear in the 13% who are aware of the atheist definition and don’t know if God exists. Thus, six in ten answer in a manner that one might expect. Would Americans be more likely to vote for the 5% who are unaware that an atheist is someone who does not believe in God or of the even larger 35% of atheists and agnostics who are aware of the definition but who also say they believe in God? Overall, 37% believe in God regardless of awareness of the definition. This seems like a remarkably interesting finding that was not mentioned in the widely cited study of religious knowledge (...belief in God among atheists is something Pew has documented elsewhere, see pg. 5). The Pew report compared average religious knowledge scores across different religious affiliation sub-groups. Self-identified atheists and agnostics did indeed outscore those of other religious affiliations. 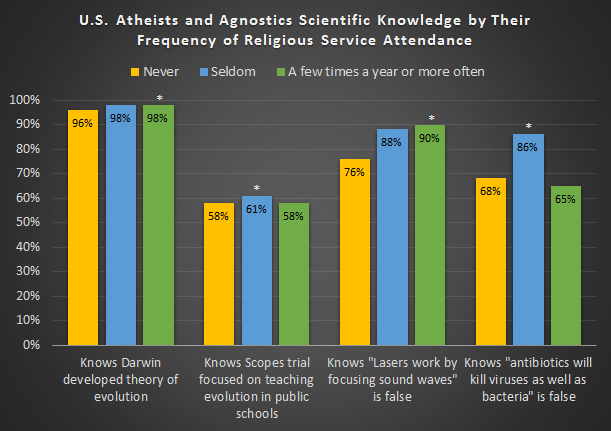 But there are indications (...perhaps glimpses is a better term given sample sizes) that atheists and agnostics who don’t believe in God and/or never go to religious services are slightly less knowledgeable than other atheists and agnostics who are either open to or believing in God or who go to religious services with some frequency. 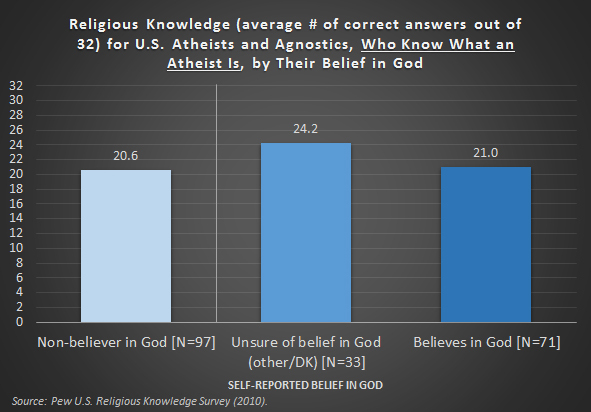 The figure below isolates the 201 atheists and agnostics surveyed who know that an atheist is someone who “does not believe in God.” It shows the average total score on the religious knowledge quiz for those among this group who 1) personally do not believe in God, 2) who are unsure of a belief in God, and 3) who believe in God. The non-believers score an impressive average of 20.6 out of 32 but those unsure of a belief in God (24.2) and those who believe in God (21.0) score even higher, on average. It makes sense that atheists and agnostics who go to religious services might be more knowledgeable about religion because they hear religious content there. But should those open to belief in God or those attending religious services also be more informed about science? The survey included a series of questions that measured scientific knowledge. As shown in the figures below 97% of those who do not believe in God know that Charles Darwin developed the theory of evolution and other atheist and agnostic respondents were less likely to get this correct. 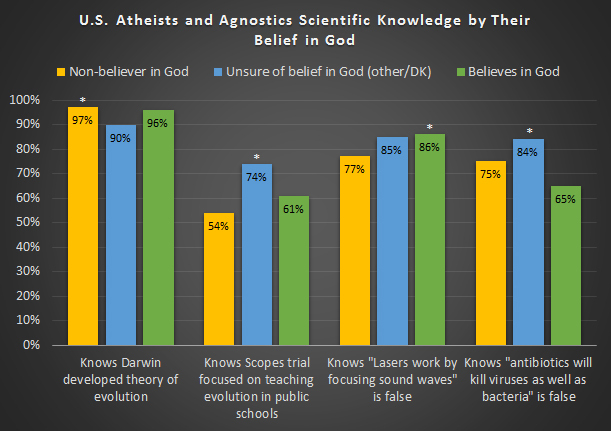 In all other cases, those open to belief in God or who believe in God were more likely than non-believers to correctly answer three other scientific knowledge questions. 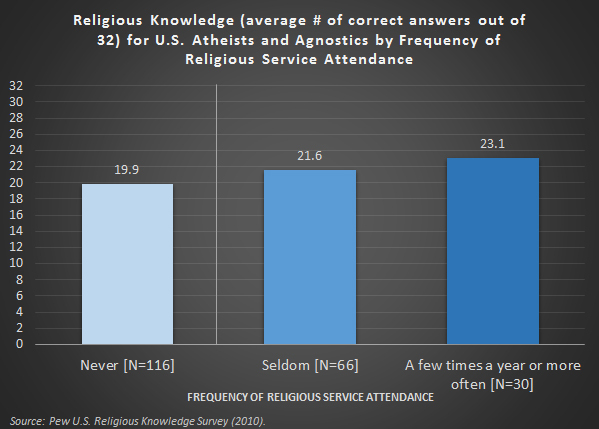 The second figure shows that those with some religious service attendance were more likely than those who never attend to answer each of the science questions correctly. A: I did not create the sample nor conduct the survey. Pew did and many in the news media made much out of the “If you want to know about God, you might want to talk to an atheist” based on this very same, identical, small sample. If the results above regarding the percentages of atheist and agnostics who know the definition of an atheist or who believe in God are, in your opinion, “invalid” so is the finding that atheists and agnostics are the most knowledgeable. Recall that Pew also included other even smaller sub-groups in its analysis that made news (e.g., 117 Hispanic Catholics were interviewed and reported on. Small sub-groups are generally not uncommon in survey reports and can be found in other recent Pew research). The margins of error are, in my opinion, quite high. But then again I am just pointing to a source that made a lot of news and noting that there is more of a story in that data that I think deserves exploration in future studies with larger sample sizes. A: Pew doesn’t mention many results in reports that one can find in their data (e.g., our previous post). No one can completely describe all the possible relationships in a data set—especially when one is on deadline to produce a summary report when the data are fresh. Greg Smith, who worked on this study, is in my opinion one of the leading religious researchers in the country. Yet, it would be unrealistic to expect even the best researchers to uncover every possible interesting finding in their data. Often they spend many years examining and publishing out of the same data set before it is fully explored. It is also the case that Pew seems to have a very direct reporting style. They present topline and sub-group results in reports and do not venture extensively into other aspects or connections in their data (...they seem to be doing more of this in their Fact Tank blog). Thankfully, Pew provides their data to researchers to study and publish with the data further. A: When we noted the low retention rate for atheists someone replied “These were apparently culled from raw data supplied to CARA. They should perhaps then be taken with a grain of salt, as CARA is religiously affiliated, but we'll accept them as is.” When “too small an N” or “Pew didn’t report it” doesn’t make the reality of a finding one does not like disappear there is always the fallback of CARA or Georgetown being Catholic institutions. It’s nice to see we still get the benefit of the doubt by the commenter quoted above. The Catholic Church certainly listens to and learns from atheists. I would hope atheists could fathom accurate and unbiased research coming from an academic, religiously-affiliated center staffed by social scientists. In the end, math works the same for anyone, regardless of religious affiliation (...and again the data are available for anyone to download and examine themselves). A: This is the standard in both academic and non-academic survey research. Self-identity is always used. Survey researchers find all kinds of oddities in polls such as “very liberal” Republicans, Catholics who do not believe in God, or Nones who are born-again Evangelicals. The world is complex and no one has a monopoly on defining membership in the “atheist” community. For example, one of the world’s most famous living “atheists,” Richard Dawkins, is an agnostic (or perhaps a “de facto” atheist) and not entirely sure God does not exist. A: Reporters should make a greater effort to skeptically depart from the press releases. Increasingly the news people follow, discuss, and trust is data-driven (1, 2, 3). Good reporters of the future will be those who can engage the data. In my own discussions with journalists I have really appreciated Jerry Filteau and Fr. Thomas Reese, SJ (also a social scientist). On a number of occasions interviews with them have led me to go back and re-examine some facet of the data. Both look for more than what is in the report and start with a skeptical or questioning point-of-view. They are the types of journalists that I can say have made me a better social scientist. Researchers should do more to be sure misconceptions are not being made by omissions in their reports. Too often religious research for media and public consumption seems to be more of an impressionist painting than a high-definition photograph. I think it is our responsibility to note all the quirks we find—even when these may detract from the headline narratives. Reality is complex, important, and beautiful (...most of the time). Thanks to Pew, I am now confident that there really are knowledgeable atheists who know what an atheist is but who also believe in God and go to Church a few times a year (athough few people other than me are aware of this). The world is a big place and there is room enough for everyone in the portraits we paint with data. Exam results image courtesy of Pete. In 1931 Vatican Radio began transmitting a signal and these waves have now traveled very far through our galaxy. Someone out there was listening (...call it “The Pope Pius XI Effect”). Next Sunday at Mass look closely at your fellow parishioners. Welcome them. Really emphasize “peace be with you” because many of them are clearly from outer space. This has to be true because it is the only way I can make sense of much of the research about American Catholics in recent headlines. Immigration and fertility trends seemingly spell even more doom for the growth of Catholicism (…as the story goes). So just who is walking through Robert Putnam’s church door from American Grace to take the place of all the Hispanic and non-Hispanic Catholics sprinting to their cars in parish parking lots (…searching for Protestant churches on their GPS systems)? There has to be someone because the figures below still reveal one giant, stubborn, inconvenient (often ignored by the news media) truth that challenges many of the simplistic narratives in the headlines. 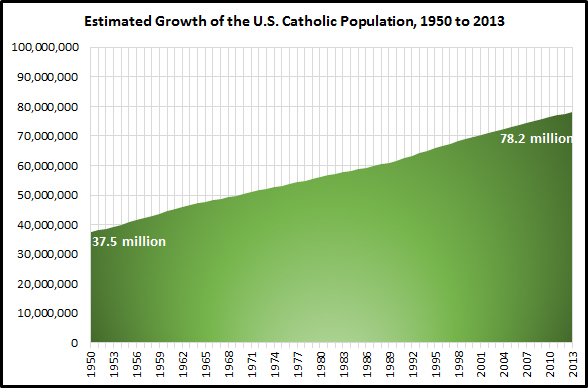 The Catholic population is growing. How do we solve this paradox? Pew, Gallup, and PRRI all do good and reliable research. I frequently use and enthusiastically cite their data on this blog. However, the manner in which their research is often communicated and then translated by the press tends to be a bit sensationalistic and lacking of a complete context. Only after the news stories have all been written does a more comprehensive and realistic tone seem to set in. For example, see John Allen’s enlightening interview with Pew researchers regarding the numbers on Catholics leaving the Church. Louis Lugo notes, “From headlines, they may have the impression that the Catholic church is just bleeding members, but that’s out of context. You have to compare it to retention rates of other religious groups” and Greg Smith indicates, “Because so many people were raised Catholic, it means that in terms of raw numbers, there are a lot of former Catholics out there. It’s not because Catholics do a worse job keeping their members, but because so many were raised Catholic.” By contrast, research reports and executive summaries often seem to include more hyperbole chasing headlines. Journalists also seem to lose too much of the research in translation for a more sensible portrait to emerge. Although the “sky is not falling” there is certainly some cause for concern about how the Church is doing Hispanic Ministry. 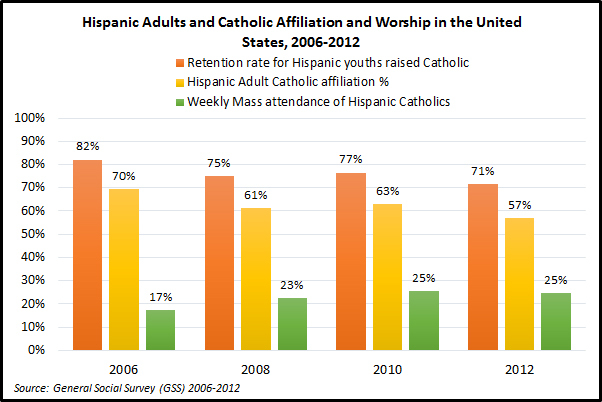 As shown below, the retention rate and affiliation rate among Hispanic Catholics are indeed declining. Mass attendance rates are more stable. 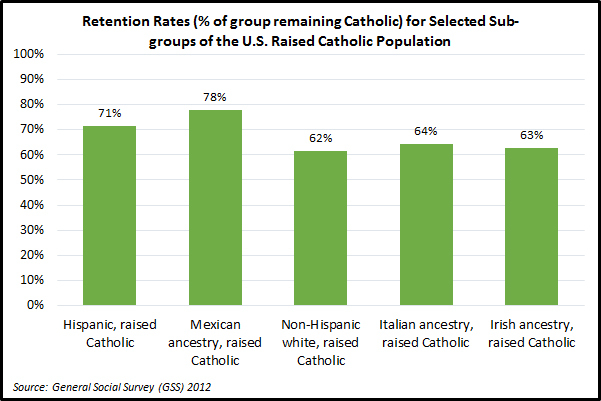 It is important to note that a 71% retention rate is still comparatively very high (...to estimate a retention rate divide the number or percentage of those who currently self-identify as Catholic by the number or percentage of those who were raised Catholic). As we’ve noted before, the only religious sub-group in the U.S. with a retention rate above 80% are those raised Hindu (84%). Only four others have a retention rate above 70%: those raised Jewish (76%), Muslim (76%), or Greek Orthodox (73%). Thus, even though one could say with the GSS data that more than one in four Hispanics raised Catholic are now “former Catholics” (27%) it is also the case that few other Americans are as likely to remain in their childhood faith as Hispanics raised Catholic. As you can see in the figure below, the descendants of distant European Catholic immigration are less likely to have held on to Catholicism if they were raised as such. 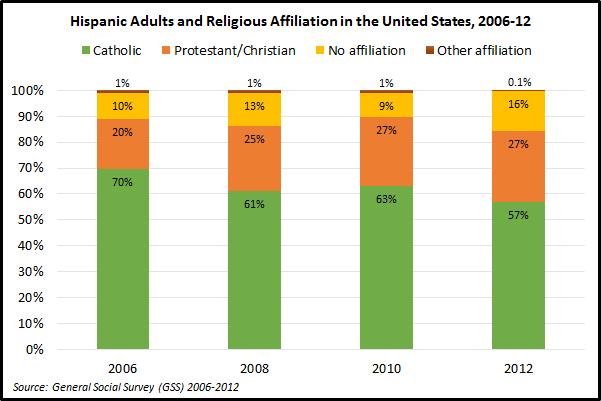 Hispanic Catholics appear to be regressing toward a similar retention rate over time with those of Mexican ancestry being the most likely to remain Catholic. Yet the Church still needs to ask, where are Hispanics who become former Catholics going? Disproportionately they become Protestants. One of the big challenges for the Church’s Hispanic ministries is to figure out what Hispanic former Catholics are seeking and finding in other churches. A religious switch does not always reflect an institutional cause or failure but surely the Church should introspectively look to see what may be lacking in its own ministries and what can be improved. Hosffman’s new study provides an unprecedented opportunity to do this. It reveals both challenges as well as some extraordinary growth in the Church. CARA research indicates that some of the most important changes are occurring among parish leaders. For example, only about 3% of U.S. Catholic priests and men and women religious self-identify as Hispanic or Latino. But the average age of priests is in the sixties and men and women religious are even older, on average. Their demography reflects the racial and ethnic diversity of Catholics born in the 1950s. Younger priests are more likely to self-identify as Hispanic. 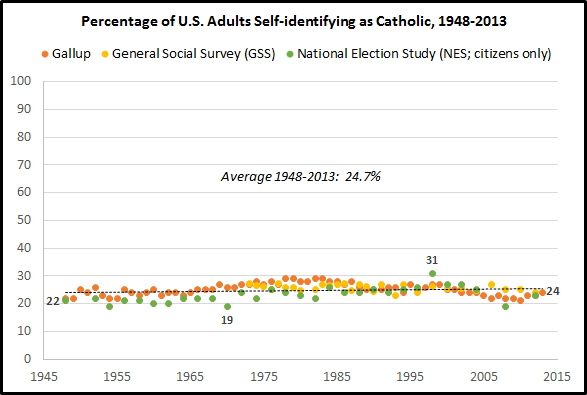 Fifteen percent of priests born since 1960 self-identify as such as do 16% of permanent deacons. Eighteen percent of religious women and 11% of religious men professing perpetual vows in 2013 self-identified as Hispanic. Only about one in ten Lay Ecclesial Ministers (LEMs), professional lay ministers working in parishes (e.g., music director, director of religious education), self-identifies as Hispanic (9%) but again many of these ministers are in their late fifties. Big changes are coming soon with 43% of students currently enrolled in U.S. lay ministry formation programs self-identifing as Hispanic (...for more research findings see CARA's new Hispanic Catholic Fact Sheet). Another area of concern is those who leave for no faith at all. A growing number of Hispanics say they do not have a religion when asked the standard survey-based affiliation question. Yet it is also the case that many in this group also self-identify as born-again or Evangelical. A recent Gallup study indicates about a third of Hispanic Nones self-identify as such. Can someone be an Evangelical or born-again None? There are so many paradoxes and mysteries to explore in religious research (e.g., 14% of atheists believe in God...). On that note, keep your eyes open this week for Catholics in the pews with pointy ears, three eyes and/or antenna... If you were only to go by news headlines you’d have to find a solution to the Catholic population paradox somewhere! 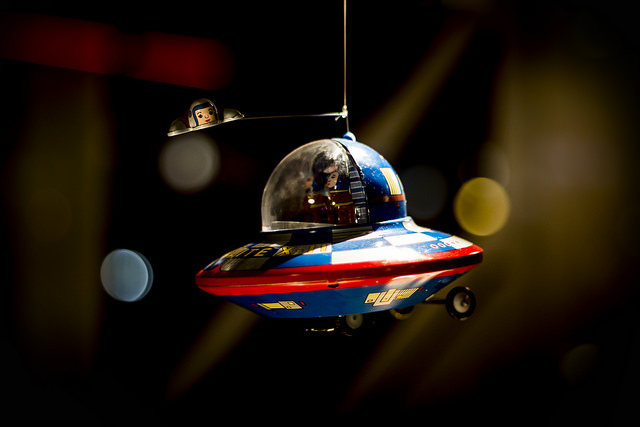 Toy UFO image courtesy of Marc Brüneke.